Home » Gate » Calculate Gate 2015 score by yourself ! 1) First Download answer keys for Gate 2015- Mechanical Engineering answer keys are already uploaded by our team with explanation. 2) If you have forgotten the actual answers submitted by you during Gate examination then don’t worry !. Your answers sheet is now available on Official Gate site. Login with your login details i.e. Enrollment Id and Password. After that you will gate a message : Your application is found to be in order and has been accepted. Click on View response : You will redirect to your Question and answer that written in Gate exam. 4) Compare both the answer keys .You will get your gate score !!! 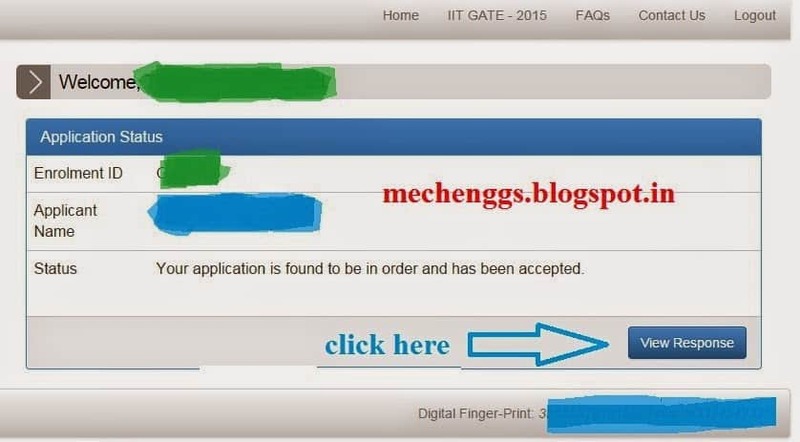 For GATE 2015 the entire process of filling up of application form, uploading of certificates/documents, etc., will be online and the candidates should not send any hard copy of their application form/documents, etc., to any of the IIT/IISc zonal GATE office.